Despite a prolonged slump in the housing market, the demand for residential green building remains strong. More than ever, professionals need reliable information about how to construct or retrofit livable, sustainable, and economical homes. 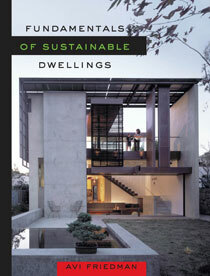 With Fundamentals of Sustainable Dwellings, Avi Friedman provides that resource. While other books on residential green building are often either superficial or overly technical, Friedman gets it just right, delivering an illustrated, accessible guide for architects, developers, home builders, codes officials, and students of architecture and green design. Friedman charts a new course for residential building—one in which social, cultural, economic, and environmental values are part of every design decision. The book begins with a concise overview of green building principles, covering topics such as sustainable resources and common certification methods. Each following chapter examines a critical aspect of green home construction, from siting to waste management options. Friedman provides basics about energy-efficient windows and heating and cooling systems. And he offers innovative solutions like edible landscaping and green roofs. Friedman knows that in green building, ideas are only as good as their execution. So in each chapter valuable data is assembled and a contemporary project in which designers strove to achieve sustainability while adhering to real-world constraints is featured. The result is a practical guide for every professional in the burgeoning field of residential green building. "Environmental sustainability is not about current fashion; it is about timeless principles. Avi Friedman lays out a comprehensive set of principles for sustainable home design that will be of interest to both students of architecture and the curious public. His case-study-based approach appropriately focuses on small, urban projects. After all, what is more green than urbanity, and how much house is enough?" "For those aspiring to build green, Avi Friedman's book is a first stop. From siting to sizing and shaping a future-forward home, this book spells out all the indispensable strategies. Along with a wealth of informative text, this compendium is infused with instructive graphics, and each chapter is punctuated by one or more elegant case studies." "This book offers designers a much needed resource as we work in the area of sustainable residential architecture. Professor Friedman is a luminary in the area of affordable residential design and his visionary book is clear and well illustrated. This is a much needed title in this emerging field." "This volume on home design offers readers with an interest in sustainable development a primer on key principles of construction that work in concert with natural environments and that respect fundamental principles of environmental conservation." "Friedman gets it just right, delivering an illustrated, accessible guide for architects, developers, home builders, codes officials, and students of architecture and green design. Friedman charts a new course for residential building—one in which social, cultural, economic, and environmental values are part of every design decision. ... The result is a practical guide for every professional in the burgeoning field of residential green building."